* Roll The Stones & The Bol. For you guys- who for some odd reason like to follow Jeff Eats and Mrs. Jeff Eats’ social calendar- on Saturday Night, April 27th, 2019 starting around 6pm you can catch us at the Seminole Casino Coconut Creek, 5550 Northwest 40th Street, Coconut Creek, Florida 33073, (954) 378-7850. 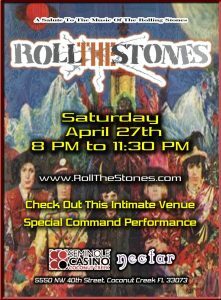 The plan- Chinese food at the Casino’s- The Bol and then catching Roll The Stones (complimentary show from 8pm-11:30pm) one of America’s best Rolling Stones tribute bands in the Casino’s- Nectar Lounge! 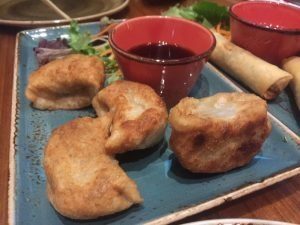 Talk about killing 2 birds with 1 stone (pun intended)- off the chart delicious Brooklyn Jewish American Chinese food and dead on Stones’ covers! The Bol’s food is delicious and Roll The Stones is a terrific band. Ive seen Roll The Stones a number of times and they are terrific. Very entertaining. Ive eaten in The Bol twice and their food is delicious. A drop pricier than most local Chinese joints but nothing to be concerned about.